As a Merchant, the AutoShip program helps you create recurring revenue from your clients and earn customer's loyalty to your services. For your visitors, AutoShip is a great way to set up convenient repeated delivery of their favorite products. The AutoShip/Recurring order system allows customers to select the preferred frequency for their orders when adding products to the cart; the frequency is specified per product so customers can have multiple AutoShip orders at the same time. In addition, the My Account section is used to manage the recurring orders online, change their frequency, cancel an AutoShip order, update the credit card information, etc. Q: how far out can autoship be set for? We would need an autoship set for 1 year-can this be accomplished with this application? A: There is no limit regarding the Frequency, it's specified in terms of day, but you could set it up to 365 days if needed. Q: Would price changes on products automatically update the recurring orders placed before the price change? A: No, the price of the product is saved with the order when the order is placed, no changes to the product name or price would be reflected in the recurring order. Q: Does this app work with Square payment system? A: Yes, this works with Square. Q: What is the setup fee for the Autoship plugin? A: There is no setup fee. Q: Can I create a promotion that only applies to the first order and not to the recurring orders generated after that ? A: By default, the promotions will only apply to the first order. There is a setting under the Store Modules for "Keep discounts on subsequent orders" that will allow to carry over the discount if needed. Q: If I delete or change a promotion that was applied to a recurring order, would the discount still be applied to future orders generated by that recurring order? A: If the "Keep discounts on subsequent orders" setting is enabled, the discount received in the first order will be carrier over to the subsequent orders regardless of the status of the original promotion. 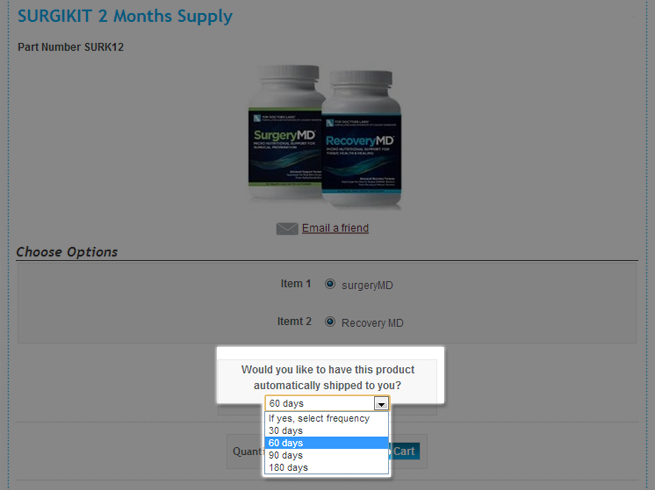 The only method to remove or change the discount would be by updating the recurring order via the admin panel. Q: How do my customer cancel the order/subscription?